Lots of words have been spoken about time trials, not all them all of them suitable for publication. 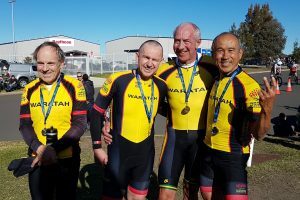 The first word that came to mind when The Captain, Paul McKay, asked Jack Yuen to join a Waratahs team for the NSW Club Team Time Trial Championships was emphatic, potentially offensive but ok for usage in this report. Jack got straight to the point – “no”. Jack thought that he had no chance. I guess Jack was like a lot of us. Hadn’t done one, not his thing, it seemed too hard, didn’t have the right gear and so on. But Paul can be persuasive and so it was that Jack bit the bullet, did the training and wound up with three of his fellow Waratahs on the line at Braidwood Rd south of Nowra last Saturday. Paul, Jack, George Flory and Denis Fahey were entered in the 180+ division, open to teams where the ages of the three youngest riders added to at least 180. Plenty of wily experience and road-hardened kilometres in that division. All Jack wanted was not to let the other guys down. 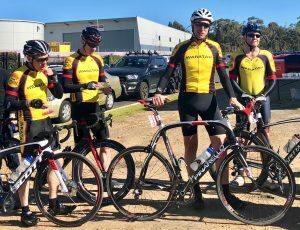 On the same day, another bunch of Waratah neophytes were anxiously checking tyres, adjusting gear, watching the countdown, admiring the “pretty souped up bikes” and pushing back the niggling thoughts about whether this was really a good idea after all. Colin Petrie, Paul King, Dave Pearson and Jayson Littlefield were in the 150+ division. They’d only had time for one practice run, along the M7 bike path, and if it wasn’t beautiful, at least they had been able to identify opportunities for improvement. (Actually, Col described it as “rubbish”.) Today they were lined up against a relatively large assembly of 23 teams, many of whom could probably teach them a thing or two from years of experience at the so-called race of truth. For those who don’t know it, the Braidwood Road is tough. It’s clean but coarse surface lurches slowly uphill to a height of 360 metres, higher than the highest point in the Sydney basin – Woronora Trig Station at 282m – and standing 55 metres above Centrepoint Tower. If you have any weakness, it is sure to be exposed on the long drag to the turnaround. The run back is basically a long downhill before a short final extension with a small rise and fall, so it’s hammer time and hang on if you can! Both the Waratah teams were very mindful of the risk of losing shape or even riders on the way out. Team time trials are indeed a team game, and riders who need help on a particular type of terrain or at a particular stage may well make the difference at other points on the journey. You can also take advantage of the rule that the team’s time is marked on the 3rd rider across the line, giving the opportunity for one rider to be sacrificed for the team result. The guys had put in a top effort. Against some very tough competition, they had won silver, a fantastic result. Not only that, but their team focus had paid off – Denis’ last turn had been very important in gaining them the 3 second margin that kept them in front of the bronze medallists. In the younger masters division, Colin and his crew were facing what he described as “the battle with ourselves”. That is, the challenge inherent to all TT’s of managing the depletion of individual resources, while co-ordinating the ride so that everyone can give their best. Their crew wisely backed off at one point on the upward half of the ride, so they could keep all aboard, and they got the benefits on the way back. Col said that Dave and Jayson were so strong on the return that there were times he struggled to come through. But come through they did, as the team, all of whom were first-timers and riding road bikes rather than TT rigs, finished with a very creditable 12th position. It had been a great experience and the Waratahs had all done really well. We’ll give the last word to Colin. When asked whether he’d be up for another crack next year, he was just as concise as Jack had initially been. “Definitely”, was Col’s verdict. Go team, and well played. You’ve done the club proud.